Fan Appreciation Night is set for April 12 in Rochester. 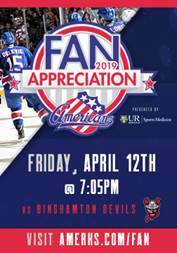 The Rochester Americans will hold Fan Appreciation Night presented by UR Medicine Sports Medicine during the team’s regular season home finale on Friday, April 12 at The Blue Cross Arena versus the Binghamton Devils. As a way of thanking Amerks fans for the tremendous support they have once again shown the team this season, the Amerks will be giving away great prizes throughout the night. Select Season Ticket Members will be chosen during the game for the opportunity to receive the jerseys “off the backs” of the Amerks players following the conclusion of the 2019 Calder Cup Playoffs. The Amerks Team Store presented by ADPRO Sports will be offering a store-wide 30% discount for all items on entire in-store purchases for next Friday’s home finale. Fans can take advantage of this special offer beginning at 11 a.m. through the end of the game. This sale cannot be combined with any other offer and is only available while supplies last. In addition, the discount cannot be applied on dot priced items. All tickets to the game are just $18 for best-available seating with $10 tickets available for kids 12 and under. Tickets for Fan Appreciation Night are available at www.amerks.com/fan. Fan Appreciation Night will kick off with the Genesee Pregame Happy Hour, where fans 21 and over can enjoy live music and $2 Genesee and Genesee Light drafts in the Genesee Brew House Upper Atrium Bar from 6 to 7 p.m. The band Something Else will perform live during the Happy Hour as well as during the first intermission. Prior to the game, the 2018-19 Team Awards will be presented, including the Most Valuable Player, Most Improved Player, Rob Zabelny Unsung Hero and the Fairand O’Neil Sportsmanship Award, while the Amerks Booster Club Awards, such as Rookie of the Year and Most Popular Player, will also be announced. Other prizes to be given away to select fans during the game will include a variety of autographed merchandise from the Amerks, Buffalo Sabres and Buffalo Bills, as well as gift cards and coupons from various Amerks partners. Special-edition Fan Appreciation Night Mystery Pucks will be available for $10 in the upper concourse during the game as well, with each one signed by an Amerks player. For more information, please visit www.amerks.com or call 1-855-GO-AMERKS. Be the first to comment on "Amerks Fan Appreciation Night slated for April 12"